Imagine; you've finished your food shopping, go out to put your groceries in your car and you notice a small river of green liquid oozing from underneath. “Yikes! Is that green stuff coming from my car?? ?”There’s a pool of ‘green blood’ under my car…Is it an Alien’s?...Should I be concerned? That "green stuff" is not some weird alien blood (although to some, a car may seem like an alien)! It is anti-freeze – AKA coolant. GET THAT LEAK FIXED right away if you are concerned about keeping your car running, and or about keeping the environment and or animals safe! The loss of coolant often leads to overheating of your vehicle’s engine. While we have established that the "green stuff" is not alien blood, you also need to know that it is not merely colored water. Appearance can be deceiving! Handle it carefully. Coolant is made with ethylene and propylene glycols that are manufactured from natural gas and crude petroleum (non-renewable resources). It has additives such as corrosion inhibitors, ph buffers, and anti-foaming agents. Without all those additives, coolant cannot do all of its jobs well. Besides being poisonous in and of itself, coolant becomes increasingly toxic while circulating in your car, as it then is contaminated with heavy metals such as lead, cadmium, chromium, iron, copper and zinc. Water Star Motors has all used coolant picked up to be recycled! This recycling process is regulated by standards set by the automotive industry. 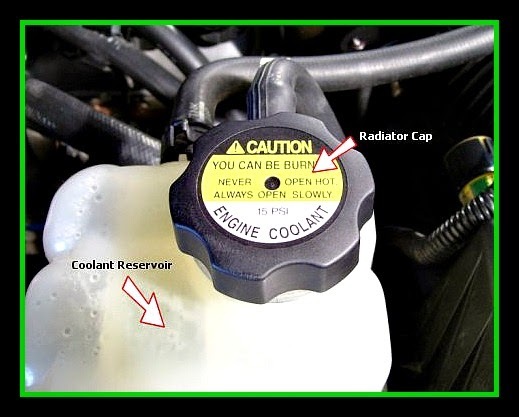 Helpful tip: DO NOT open the radiator cap on a car with a hot or overheating engine…the coolant is under pressure and could scald you. Coolant can also leak into the interior of the car (on the floor by the passenger’s feet) if a leak develops in the heater core. Side Note: During the hot season when the car’s air conditioning is being used there will often be clear water found under the car. This is the condensation from the air conditioning unit removing the moisture out of the car’s interior. Do not panic, this is normal. Stay tuned –Coolant System Part 2 will be in the next Rock, Paper, Car.